A giant hidden river flows beneath the jungles of Brazil. The territory in Brazil has 20% of freshwater on the planet, but apparently, this number may be even greater. According to the State agency, Researchers at the National Observatory (ON) found evidence of an underground river of 6,000 km in length, which runs down the Amazon River, at a depth of 4000 meters. The two streams still have the same flow direction, ie from west to east, but its features are quite different.Brazilian scientists have discovered the existence of an underground river about 6,000 kilometers long running 4,000 meters deep below the Amazon River. 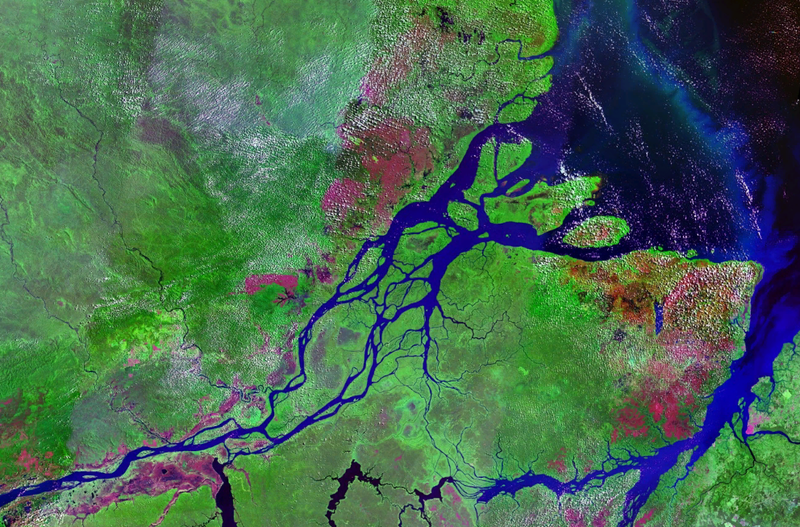 The discovery is the result of a decade of investigations conducted between 1970 and 1980 involving the drilling of 241 wells along the Amazon basin in search of hydrocarbons, gas and oil, conducted by the Brazilian Oil Company Petrobras in collaboration with the Department of Geophysics of the National Observatory and the Amazonas Federal University. The underground river runs about 4,000 meters deep in a course similar to the Amazon River and has a caudal estimated at about 3,000 cubic meters per second. This flow represents about 2 percent of the volume carried by the Amazon River which is estimated at 133,000 cubic meters of water per second. The Amazon River, considered the world’s longest and largest river (highest water flow), has its headwaters near Arequipa in Perú and runs for about 6,990 kilometers to empty in the Atlantic Ocean at a broad estuary about 240 kilometres wide in the far north of Brazil. Credit: Department of Geophysics of the National Observatory and the Amazonas Federal University. The researchers decided to name the underground river as Hamza, a tribute to the scientist of Indian origin Mannathal Valiya Hamza, living in Brazil since 1974, who has dedicated about 40 years of his life to the study of Brazilian rivers and collaborated in the discovery of this underground river, said the newspaper O Estado de Sao Paulo. (in Portuguese). The results of this research were presented last week in Rio de Janeiro at the 12th Congress of the Brazilian Geophysical Society. 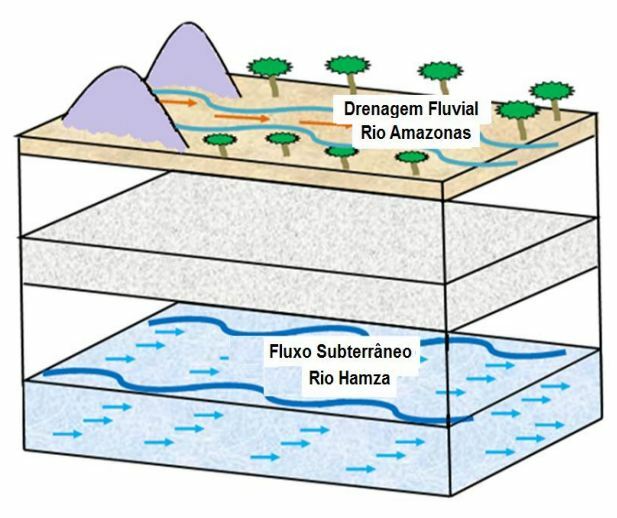 The discovery was made possible by information provided by Petrobras for operation for oil.Through the data, scientists Valiya Hamza, the Department of Geophysics of the National Observatory, and Professor Elizabeth Tavares Pimentel, Federal University of Amazonas, identified the movement of groundwater at depths of up to 4000 meters. The case was further developed in the doctoral professor Elizabeth, under the guidance of Hamza. The work was presented last week at the 12th International Congress of Brazilian Geophysical Society, in Rio de Janeiro. The groundwater flow has only 2% of the Amazon River, but has increased the flow of the Rio Sao Francisco, Minas Gerais and the Northeast and cut benefits 13 million people. Hamza The width of the river varies from 200 to 400 miles, but its waters run very slowly, because there is a tunnel through which flow freely Possani. Gradually, they overcome resistance of sediments that act as a giant sponge, the liquid moves through the pores of the rock toward the sea. It is interesting to recall that two years ago, Italian scientists have discovered an underground river that runs beneath Rome, longer than the Tiber – the third largest in Italy, with 392 km. Like Brazil, the Italian underground river found thanks to data from drilling for oil. Years ago, Russian scientist surveying the earth’s surface from space said they had discovered an underground river beneath the Sahara Desert in Mauritania. The quantity of water reserve found using hi-tech satellite imaging is enough to meet the drinking water needs of the 50,000 residents of the nearby city of Altar.